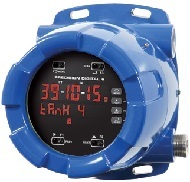 Description: The ProtEX-MAX PD8-6080 explosion-proof Modbus® scanner displays up to 16 Modbus process variables (PVs) on the bus using its RS-485 serial input. It also includes all the features of our PD8-6060 dual analog input meter, accepting two independent voltage or current signals, and scaling them for display in engineering units. Features: As a Modbus master, the PD8-6080 polls up to 16 difference devices for PV data. As a slave, a Modbus master can write up to 16 PVs to the scanner for display. In Snooper mode, it can sit anywhere on the Modbus network and display up to 16 PVs being polled on the bus. Powerful math functions allow up to four math channels to calculate summation, difference, multiplication, ratios and more. Specifications: Using SafeTouch® through-glass buttons, the Next, Previous, and Scan buttons can be accessed without removing the cover, making it easy to view the next or previous PV or pause automatic scanning. For more information, see PD8-6080 spec. sheet or PD8-6081 spec. sheet.